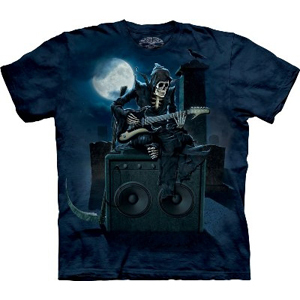 A�skeleton entertains the dead by playing his guitar in a graveyard.�A great�dark fantasy�t-shirt from Skulbone. 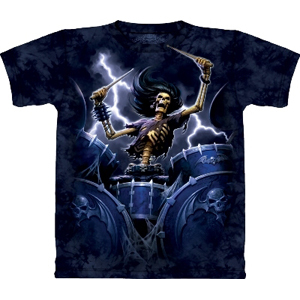 A skeleton playing the drums while lightening strikes behind him.�A great�dark fantasy�t-shirt from Skulbone.�Sizes up to 5XL. 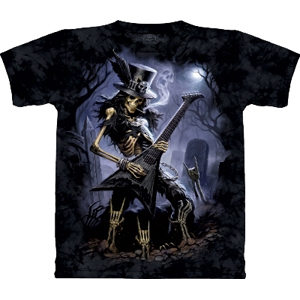 A skeleton in a black cape sat upon huge speakers, whilst strumming his guitar to the dead.�A great�dark fantasy�t-shirt from Skulbone.�Sizes up to 5XL. 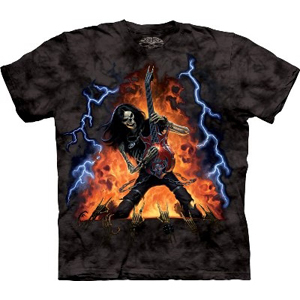 A�skeleton rocks out to the crowd, surrounded by fire and lightening.�A great�dark fantasy�t-shirt from Skulbone.�Sizes up to 5XL. Shredding as he soars into the air, can you imagine how awesome that riff is? 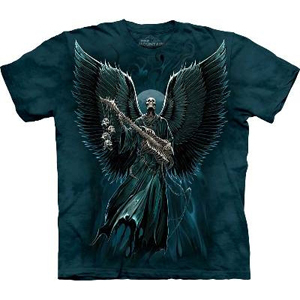 A highly detailed picture printed across the chest on a top quality cotton T Shirt.�Sizes up to 5XL. Dragons galore in this T shirt section. Dark, sinister images of dragons, dungeons, fire and other scenes you can vividly imagine.�Sizes up to 5XL. Awesome skull breaking through design.�Made in the�USA from preshrunk 100% heavyweight cotton.�Sizes up to 5XL. Awesome DJ & Music T Shirts. Clubbing Rock Raving Music Party T Shirts & Hoodies. EL T Shirts & Headphones. Record, CD, Gig & DJ Bags. Buy them all here. Copyright Head Space Stores 2018. All rights reserved.